Last week, a Texas judge heard oral arguments in a case brought by state attorneys general against the Affordable Care Act (ACA). The suit aims to overturn the ACA in its entirety on the dubious grounds that since Congress has eliminated the penalty for not having insurance, a key provision of the act, it thereby invalidated the act as a whole. The Department of Justice, which supports the lawsuit in part, wants to keep the ACA on the books but does support elimination of one key provision — the guarantee that people will get full coverage for pre-existing conditions without paying higher premiums. But that is the scariest part of the lawsuit. 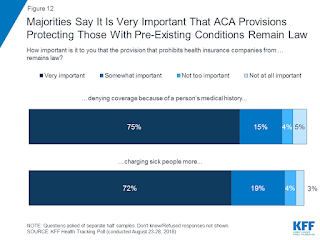 As a recent tracking poll from the Kaiser Family Foundation confirms, an overwhelming majority of people support the pre-existing conditions proviso. There is some cold economic rationality in tying pre-existing conditions protections to the penalty for not having insurance. The link between the two is a phenomenon known in insurance circles as adverse selection. Adverse selection occurs when people with high exposure to risk buy insurance. Since such people are likely to have large claims, insurance companies must charge high premiums. High premiums encourage more people to drop coverage, and the insurance market enters a death spiral. Before the ACA, restrictions on coverage of pre-existing conditions were the way insurance companies fought back against the danger that people would wait to buy insurance until they actually got sick. The ACA, instead, chose to fight adverse selection with a penalty for not buying insurance. The idea was that since you would have to pay up one way or the other, you might as well sign up for a policy. 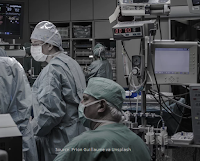 There is real cause for concern that if you leave insurance companies entirely defenseless against adverse selection, their only recourse will be to withdraw from participation in the ACA altogether. Some already have, and those that continue to offer policies on the ACA exchanges have raised premiums. Eliminating the penalty has only made the problem worse. Economic rationality aside, though, attacking pre-existing conditions protections seems like political suicide. At least some Congressional Republicans recognize this. A group led by Sen. Thom Tillis (R-NC) has introduced a bill, the Ensuring Coverage for Patients with Pre-Existing Conditions Act, to make sure people who have asthma, high cholesterol, diabetes, or other such conditions can continue to buy insurance. There is a catch, though. Larry Levitt, a Senior VP at KFF, argues in a series of Tweets that the protections in the Tillis bill are illusory. Levitt claims that the bill would allow everyone to buy a policy, but he claims those policies could still exclude treatments for the pre-existing conditions. There has to be a better way, and there is. We should solve the pre-existing condition quandary once and for all by replacing the ACA with a health care system that offers universal affordable access to everyone, regardless of their health status. Democrats are promoting Bernie Sanders’ Medicare for All as their favored way of doing this, but they encounter resistance when voters find out how much the Sanders plan would cost. Instead, as I have argued before, we could adopt Universal Catastrophic Coverage. UCC would use income-based deductibles to ensure that everyone pays their fair share of health care costs, but not more than their fair share. Under UCC, the poorest families would get full coverage without deductibles, middle-class families would face deductibles similar to those they pay under the ACA, and high-income families would be responsible for all but truly catastrophic medical expenses. Universal catastrophic coverage would be far more affordable than the Sanders’ plan, but would still guarantee that no family would ever have to choose between going without health care or facing financial ruin. We are not going to get UCC with a lawsuit — but we do have an election coming up. A new Congress, elected by voters who place a priority on a better health care system, could get down to work and give us the universal, affordable access to care that both Democrats and Republicans have promised.